Poll: Christie's GOP approval numbers up since start of scandal. 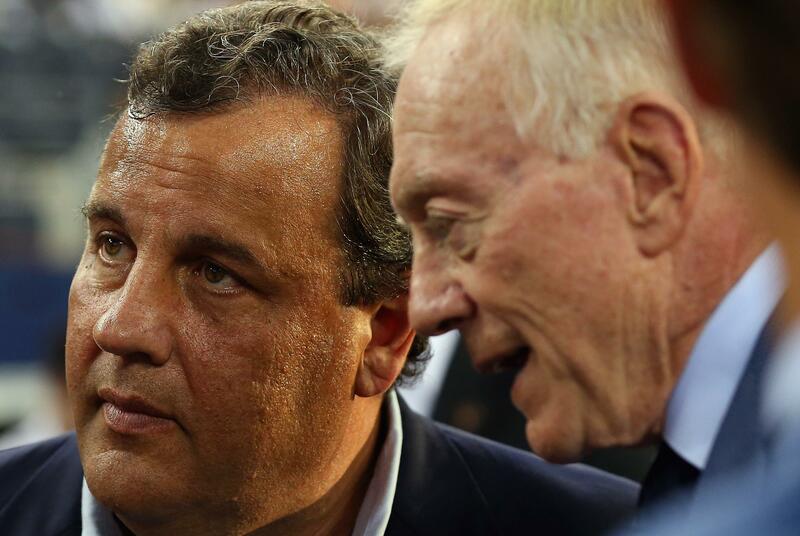 Fellow Republican Jerry Jones, right, the owner of the Dallas Cowboys, likes Chris Christie more than ever. I’ve become something of a Chris Christie Scandal Truther. The guy talked so much in his 111-minute cleanup press conference; he repeated the same answers so many times; he opened himself up to stories about possible contradictions that may or may not ever amount to anything. Today’s case study is this eagle-eyed Wall Street Journal discovery, a story so damaging that Chris Hayes pronounced Christie “toast” if it bore out. Christie had claimed “no contact with David Wildstein in a long time, a long time, well before the election.” But Wildstein was there, on Sept. 11—during the bridge lane closure!—when Christie participated in New York City’s 9/11 memorial ceremony. Of course, Governor Christie attended the September 11th ceremony as he has done every year since he took office. He had numerous interactions with public officials that morning, including representatives of the Port Authority. They were all there for one reason – to pay tribute to the heroes of 9/11. Sadly, this clashes with Christie’s strangely effusive insistence that he never talked to Wildstein anymore, and that he didn’t even know the guy, really, and that he was much more popular in high school than whoever “Wildstein” was. Does it prove that he was informed of the bridge closure’s bogosity as he walked to the ceremony? Not really—for that we need a long-forgotten live mic to emerge. A bad story on an otherwise comeback-focused day for the governor. Mike DuHaime, his chief political adviser and a familiar voice to national reporters, told Robert Costa EXCLUSIVELY that Christie was getting “positive, proactive” feedback from Republicans. You laugh—what else would DuHaime say, that David Koch sent the governor a dead fish in a brown wrapper?—but then you look at the Monmouth poll, the only one taken in New Jersey since the scandal began. Emphasis mine. The Republican uptick is a better omen for Christie than anything else in the poll. There are conservatives who, like M. Stanton Evans once said of Nixon and Watergate, like the governor better because of the scandal.